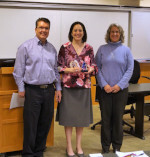 The Outstanding Member Award is an annual award given to a member who has made a major contribution to the Nebraska Mediation Association through their efforts, leadership, or professional involvement in the field of mediation. For 2018, the Outstanding Member Award recipient is Kristen Blankley. Associate Professor Kristen Blankley has been highly active in Nebraska mediation practice and policy since she began her tenure at the University of Nebraska College of Law in 2010. She is a volunteer mediator affiliated with both The Mediation Center and The Resolution Center, where she works on a wide variety of cases, including family, small claims, civil/employment, elder/probate, and large group facilitation. She is involved in mediation policy at the statewide level, through her work on the ODR Advisory Committee, and she is involved nationally through her service at the ABA Section of Dispute Resolution Council and as co‐chair of the Section’s Ethics Committee. she is very active on the ADR scene nationally and gives her time to NMA as a presenter. She is scheduled later this year for an ethics webinar.